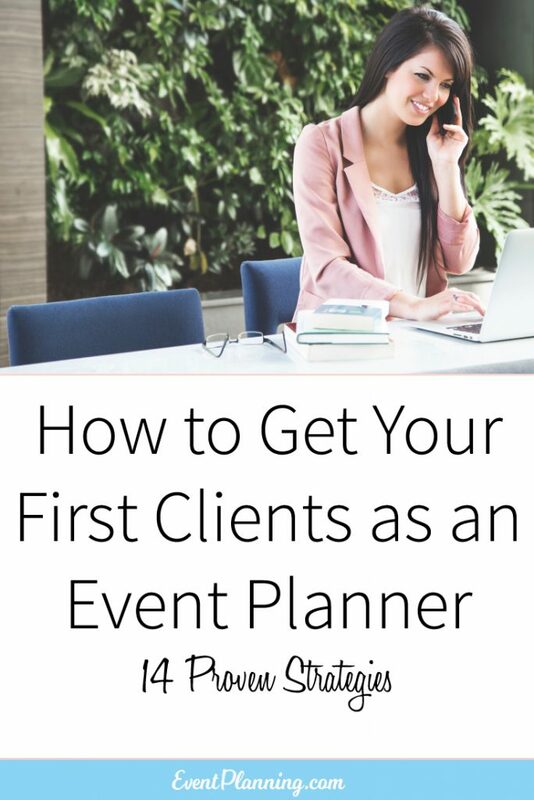 Since originally publishing this article we have heard back from so many students about their successes in getting new clients so we are updating this article with all of the methods that have been working for our event planners. These are methods that are not discussed on any other event planning sites so get out your notebooks and write down your favorite methods! If you do not yet have a portfolio we recommend starting with your inner circle – this is your friends and family. Email everyone in your inbox with a personal message letting them know about your business. Post on your own Facebook page once every other week about your new business. Text everyone in your phone. Call close friends and let them know what you’re up to. Give business cards to your friends that they can pass out. Offer to do a free event for your friends and family in exchange for a Yelp review, photo shoot and testimonial. Ask friends to share your website on their Facebook page. You can also tell former bosses, past business acquaintances and former co-workers. There are ways to communicate these messages to them without being overly salesy. Trust me when I say they all want to hear about your new adventure. Once you reach out to your inner circle, you can launch a social media outreach campaign. Post images of your events or other beautiful events you like on Instagram. Follow and connect with similar people on Instagram. Join Twitter and use the “advanced search” function to find brides-to-be, corporate clients, venues, vendors, etc and begin following and interacting with them. Join local community groups on Facebook and start adding value to the groups by posting your knowledge. They will quickly view you as an expert and reach out to you. Post your knowledge on your Facebook page. You can also run contests to give away a free event. Partner with local restaurants or venues to post content on their Facebook pages (great idea!). Get a past client, family or friend to do a short Youtube video review of your work. Social media works but it takes a little time. You have to create a strategy (use the one I just wrote above) and execute on it every single day. Just do one small thing on social media once per day. We call this “planing your seed”, and in a few months the seeds you plant in the social media world will grow to be large, beautiful, healthy trees. When you begin marketing on social media make sure you choose the same Company name on every platform (same name on Twitter, Facebook, Instagram and Youtube). The next place to get clients is on review sites. Yelp, Thumbtack and Craigslist are some of the best places to get new clients but the key is to have 10 or more reviews. We have found that 10 five-star reviews is the magic number. Our students’ businesses have really taken off when they diligently get to that number on Yelp and Google reviews. After you ask friends, family, past clients, vendors and venues for reviews if you still do not have 10 reviews, then you should start offering your services specifically in exchange for reviews. People will jump at the opportunity. The next opportunity that event planners don’t think about is reaching out the local media. If you are interested in pursuing the media, you should have a blog on your site to give you more opportunities to cover local events, issues or events that the media participates in. This provides extra incentive for the media to communicate with you. Offer your event or wedding services for free to well known writers or bloggers in your town. Think of a creative contest to hold and then reach out local bloggers to let them know about it. Interesting ideas like these are what bloggers and newspapers want to write about. Get writers to show your before and after photos from a Grand Opening event or local community gathering that you put on. The media uses Twitter frequently – start building relationships with them by tweeting interesting local news to them to build relationships. Make sure you read what the local newspaper or blogs write about and when you have something to say, leave them a comment or send them an email. All writers enjoy feedback and engagement about their stories. Attend local blog meetups which you can find on meetup.com. Host a local event that you organize for newspaper writers, bloggers and the media. This way you get to show off your skills, build relationships with the media, give them something fun to do and get the word out about your business. Here are some other ideas to implement into your marketing plan. The United States census shows that the event planning industry is experiencing one of the highest growth rates. The average salary of a top event planner can reach around $100,000. A recent study by Joe Goldblatt, a Certified Special Events Professional, shows that annual spending worldwide for event planning is $500 billion dollars. When starting out in the field, gaining clients is of the utmost importance to establish a solid foundation for your new business. That aspect is also one of the most difficult challenges with an event planning business. The best way to start building a portfolio is to volunteer your services to family and friends. You will feel more confident in working with the general public, once you have organized several events for people you know. Be sure to take photos and put them in a binder to show potential clients in the future. You can also use your photos for a digital portfolio to place on your website. To learn more about volunteering as an event planner, read this article: How to Volunteer as an Event Planner. You don’t have to be a computer wiz to build a website. Something as simple as WordPress and your own domain name is a great way to build authority. You can buy a domain and launch a WordPress site with a free template for less than $100 at HostGator. List your contact information, along with the services you offer, so you have a place to direct your clients when you receive inquiries. Post photos of the events you have done so your work is visible. Be sure to use keywords in your site description, such as all of the locations you service, as well as the services you provide. Your basic website will have a few pages. You can direct people you meet to your website, but to get traffic in the long-term you’ll need more content. A blog is a great way to add regular content to your site. For topics, focus on the questions your target clients have. Brainstorm 12 ideas and you’ll have enough for one blog post each month for a year. When it’s time for people to organize events they usually search around for articles and tips; and if you can position yourself as an expert in your specialty there will be a lot of eyeballs on you. For example, when a corporate event opportunity comes up and they need to hire an event planner – the decision maker will most likely go online and read information about their type of event. If your specialty is in this category and you have information online about your expertise with freely available advice potential clients are much more likely to reach out to you. Facebook Pages are very simple to create. Invite all of your friends to “like” it and ask them to “share” with their friends. You can also create ads inexpensively to grow your audience and give exposure to your services. Post photos, links to your blog and website along with any specials you are running. We will post additional articles in the coming weeks with tips on building your Facebook following in much more detail. For event planners, business cards are a must. Hand them out to anyone that inquires or leave them in places where potential clients may gather, such as coffee shops or banquet halls. Give some to your friends and family to pass out to others that may be interested. Be sure to list your website, blog and Facebook links along with the description of your services and other contact information on the card. Vistaprint is a great resource for business cards. The advantage of Craigslist is that it is free to post your services to a wide audience. Link to your website and include photos of your work in your post and direct your ad to the location of your choice. Update your listing every couple weeks to keep the listing fresh for any updates you make and fresh on the feed. Increase your credibility by having past clients leave reviews for your business on Yelp and Angie’s List. Social proof is a big part of winning over new clients. People look at reviews for most services including event planning services. You can also look at the feedback and reviews you get to learn what is important to your clients. And you can use that language and wording on your website when describing your services. The old saying, “Word of mouth is your best advertisement” is true. People tend to trust personal recommendations more than ones featured online. In the event planning world, referrals are big. To get more referrals, you’ll need to build a solid business. There’s no way around that fact. A little trick, though, to standing out in the minds of your clients is to always give them something to talk about and something to share. Let’s say you setup an employee holiday party for a local business. You can do a great job and make the client happy. But if you hire a comedian to perform a show that is something people can talk about. And always give your clients cards so they have something to hand out when their fellow business owners and managers ask about event planning experiences. Marketing your business can be fun if you create a thorough plan and systematically work on each marketing channel mentioned above. As you see progress in any of the above areas you feel immense reward and new clients begin to slowly appear. You have to learn to promote yourself if you want your event planning business to grow. Hopefully these marketing channels will provide some good ideas to get you started. We’ve seen them work for other event planners and we know they can work for you. If articles like this are helpful to your event planning, you will enjoy our full "Become an Event Planner" course. For a limited time you can try the full course for only $7 (regular price $295). This limited time trial includes how to get more clients, proposal samples, 23 free bonus templates, and contracts; as well as 11 modules and weekly projects to help grow your business, even if you have no experience. Click here to take advantage of the limited-time deal for only $7. Thank you for all these vital and detailed information. I hope it will go a long way in helping me start my new event planning business. Thanks a bunch! Its always nice to learn something new. I really love this write up. It is educating and motivating. These are really good tips. Very use-able for me. Thanks so much. I have learnt a lot. Thanks for putting some tips together for organizing a event. I like your tip to make a to-do list so you can plan everything far enough in advance. I would think that a list of tasks is the best way to stay organized and to make sure that you meet all of the proper requirements for planning. Great and very helpful article…. I have so much to offer this area of business as an event planner and with this advice, I know I’ll go further, thank you. Thank you for this great article.God bless. I want to say that I have really learnt a lot from reading your articles. You have opened my eyes to so many things in the event planning world. You guys are truly amazing. I would really like to take the full course once am financially bouyant. I will not stop reading your articles as they have really being of great help.